This sweet-tart Apple Cabbage Slaw combines Granny Smith apples, raisins, and a Greek yogurt dressing for a light and fresh twist on classic slaw. Prepare the dressing by stirring together the mayonnaise, Greek yogurt, apple cider vinegar, honey, and salt. Remove the core from the cabbage, then shred the leaves into very thin strips. Peel the carrot, then shred it using a large holed cheese grater. Wash the apple well, slice it in half, then remove the core with a melon baller or sharp spoon. Use the cheese grater to shred the apple. Press the shredded apple between a couple pieces of paper towel to absorb the excess juice. 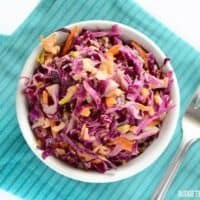 Place the shredded cabbage, carrot, apple, and raisins in a large bowl. Add the dressing over top, then stir until everything is evenly coated in dressing. Serve immediately. Using a 50/50 mix of mayonnaise and Greek yogurt keeps the dressing creamy, but light. You can change the ratio, but it will change the flavor and texture of the dressing. I used light mayo and low fat Greek yogurt and the flavor was still great.